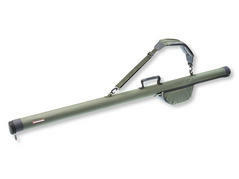 Very affordable rod bag for the transportation of numerous mounted and unmounted telescopic or detachable rods. The main compartment is separated via 2 flexible dividers to store the rods perfectly organized. With a long outer pocket for rod holder and umbrella, which can be opened widely via zipper and closed via separate loop. Equipped with a strong and reliable 10mm tent zipper. 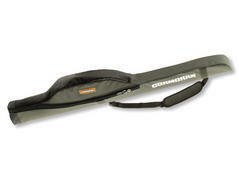 The adjustable shoulder strap is designed in a way that guarantees convenient transportation even when fully loaded. 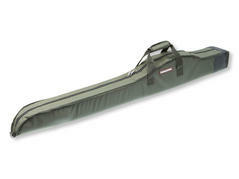 Very affordable rod bag with one main compartment, which can shelter up to 3 mounted rods easily. With long outer pocket for rod holder and umbrella, which can be opened widely via zipper and closed via a separate loop. Equipped with a strong and reliable 10mm tent zipper. The adjustable shoulder strap and the solid handle are designed in a way that guarantees convenient transportation even when fully loaded. 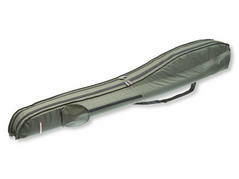 Hardcase rod bag, which can shelter 2 mounted rods easily. Due to the hard shell, the rods are perfectly protected against shocks and damage during transportation. Of course also the reel compartment is thickly padded to offer optimal protection. Equipped with a strong and very reliable tent zipper and a padded, adjustable shoulder strap. 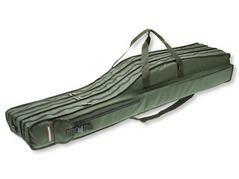 Completely padded rod bag for one or two mounted rods. Due to the thick padding, the rod as well as the reel are perfectly protected against shocks or damages during transportation. Equipped with a strong and reliable 10mm tent zipper and a solid handle. Classical holdall with "Full Shock Protection" lining and three separated compartments for rigged rods. The large superimposed pocket, which can be opened via zippers, offers enough space for an umbrella or banksticks. With 2 adjustable rucksack shoulder straps, carrying handle and robust eyelets. 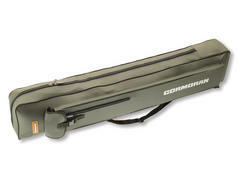 High-end rod case with "Full Shock Protection“ lining. 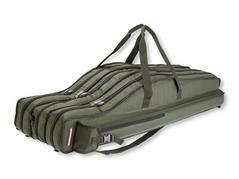 With 2 separated compartments, which can easily store up to 4 rigged rods. With a long outside pocket, which can be opened widely via zipper and closed via loop. The big outside pocket (35x22x6cm) with solid PVC bottom is also lined and thus perfectly protects the stored equipment. 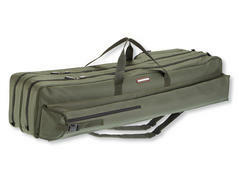 Very good valued holdall with 2 separated compartments, which can store up to 4 rigged rods easily. With a large outside pocket for rod seats etc., which can be opened widely via zipper and closed via loop. 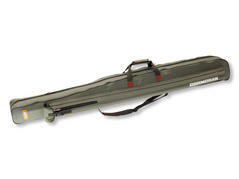 Classical rod case with 3 separated compartments for rigged rods. The long outside pocket, which can be opened via zipper over the whole length, stores umbrella or banksticks. Perfectly protects rigged rods thanks to its thick "Full Shock Protection“ lining. Thus you are ready to fish without the necessity of rigging your rods previously. An additional reel or an unscrewable reel handle can be stored in the small, padded pocket at the inside. The perfect protection for premium, rigged detachable rods. The solid, impact-proof plastic tube is lined with a fine nylon fabric at the inside and coated with 100% polyester 600D at the outside. 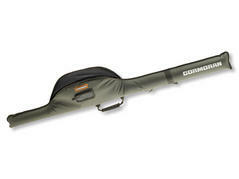 The integrated reel compartment is the highlight, thus you can store the completely rigged rod.